UK brewer Marston’s has launched a meat-free ‘bleeding’ burger, fortified with vitamin B12, aimed at a growing number of vegan and vegetarian punters. The 100% plant-based B12 burger will be available at select UK pubs from Wednesday, and is the result of a partnership with Moving Mountains that developed the Burger, which smells, tastes and “bleeds” like meat. As reported by the Express & Star, the move forms part of Marston’s recognition of a growing demand for ‘flexitarian’ dining, with more people cutting back on meat and choosing vegetarian or vegan options when dining out. The B12 burger has been more than three years in development, with over 200 test recipes tested to create the final product, which even “bleeds” from the middle when perfectly cooked, but with beetroot juice instead of blood. It’s made from a mix of natural ingredients including oyster mushrooms, pea protein and oats giving 18g of plant protein per patty. Vitamin B12, traditionally associated with red meats, has also been added so the B12 Burger can compete with a beef burger, containing the RDA (Recommended Daily Allowance) of B12. It’s served on a brioche bun with vegan jackfruit, a side of Asian slaw, chips and onion rings. “We have listened to our customers and taken the growing demand for healthier and alternative options across the pub sector as a great opportunity to develop and update our menu,” said Nicola Arrow, Marston’s senior food development manager. 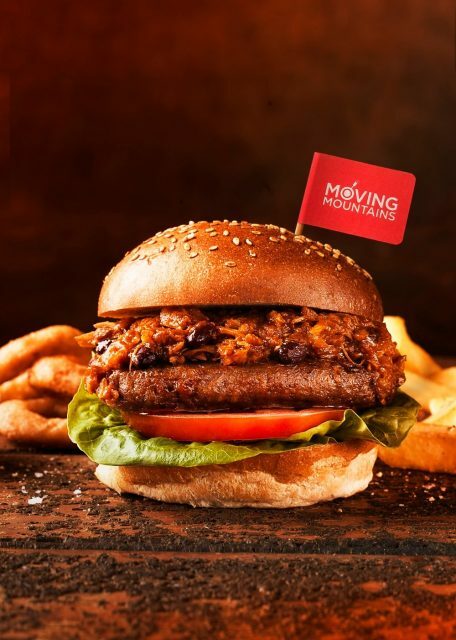 “The Moving Mountains B12 Burger is such an innovative addition to our menus that not only caters to our vegetarian and vegan customers but also to those who are trying to make more conscious health or ethical choices when eating out. Earlier this year, Greene King launched a new vegan menu at more than 100 of its Flaming Grill pubs across the UK, including vegan fish and chips, supplied by VBites – the catering company owned by philanthropist Heather Mills. While earlier this year London welcomed its first vegan restaurant. The Spread Eagle, which sits on Homerton High Street in Hackney, is owned and operated by Meriel Armitage and Luke McLaughlin, and features an entirely vegan menu. Elsewhere, a vegan wine boom is expected to predicted sweeping across Britain, with a number of retailers launching vegan range. As reported by The Guardian, the Co-op plans to increase its vegan wine range to 100 labels by the end of the year. The supermarket has been working with winemakers around the globe to develop a range of vegan-friendly fining agents. Last October Majestic added vegan and vegetarian symbols to its wine labels and on its website to help vegan wine lovers find drops that are suited to them. The retailer currently boasts 32 vegan-friendly wines in its portfolio. A list of the Marston’s pubs selling the new burger is available online at www.nomeat.marstons.co.uk, with the burger available from September 5.